Demand for Cloud talent is soaring, as employers recognise that they need to recruit specialists to lead Cloud adoption and integration. Since Cloud adoption is only set to increase in the years ahead, we can expect the war for talent to further intensify. In a market like this, it’s important that organisations take a long-term view of how they will stay ahead of the competition and secure the skills their business will need. According to Microsoft, 38% of those involved in recruiting people with Cloud skills in the last 12 months said it was difficult to find the right skills. Our experience at Experis supports this view. We are seeing strong growth in both the contract and permanent marketplace, with demand for Cloud skills outstripping supply. The permanent market is impacted by the fact that those with the right skills recognise that they can get a better return on their talent by becoming contractors. Amazon AWS skills dominate, but demand for Microsoft Azure is high too. Whilst Google Cloud is still considered niche, it looks set to grow significantly in the months and years ahead. The competition between the top four Cloud platforms is heating up. With an average salary of £68,672 across all four, Google Cloud is leading the way with an average permanent salary of £71,701. Surprisingly for one of the more established players, Microsoft Azure had the lowest average Cloud salary in Q2 2018, perhaps reflecting the strength of the Microsoft brand in the IT space. The picture in the contractor market looks a little different. With an average day rate of £478, Amazon Web Services is offering the highest amount of £502. Interestingly, despite paying the most for permanent employees, Google are paying the lowest amount (£445) for contractors in Q2. As expected, the largest proportion of hiring demand in the UK comes from Amazon Web Services, accounting for 54% of the roles advertised by the top four Cloud platform providers. 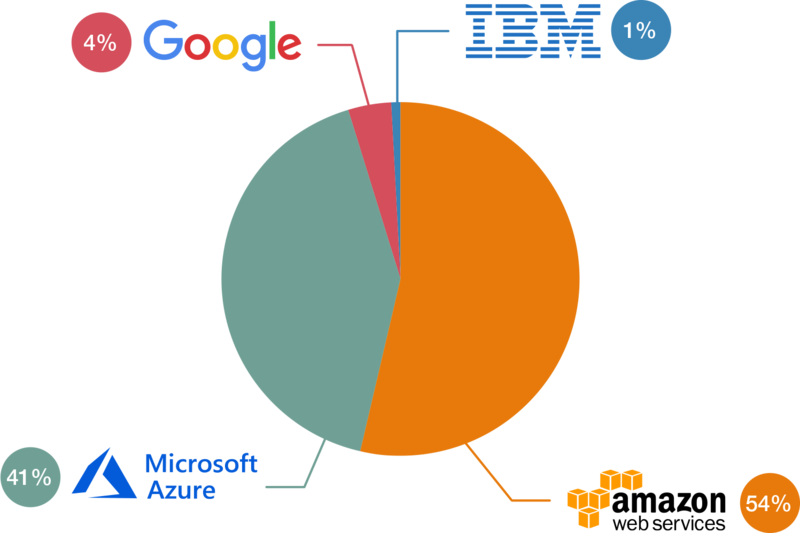 The main challenger, Microsoft Azure, is fairly close behind, with 41% of the roles advertised.